Meet author Don Bredes, whose debut novel Hard Feelings was named Best Book of the Year for Young Adults by the American Library Association. 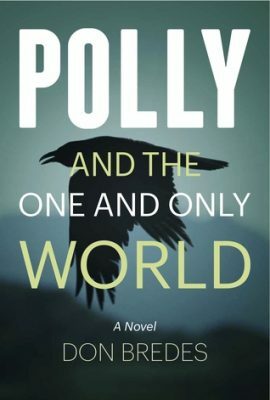 Bredes is back with another YA novel, Polly and the One and Only World, a fantasy apocalyptic novel ushering in a vision of a future world that is not so impossible to believe. In the book, a young heroine named Polly Lightfoot tries to survive results of climate change: rising seas, coastal floods, drought, and social upheaval. Mary: Hi Don, thanks for the interview! You have written a fantastic book with lovable 15-year-old Polly, who, along with her friend and raven, must figure out how to escape a fundamentalist dominion and reunite with her family; this is an epic journey up the eastern seaboard of the United States. Though fiction, this journey opens our eyes to a potential future if we’re not careful with our treatment of the environment. What motivated you to tackle this subject? Don: Thanks very much, Mary, for your interest in the novel. One strong motivation has been my reverence for the natural environment that nurtures and sustains us. Each one of our social systems–government, education, health care, commerce, trade, global relations–indeed, everything that characterizes modern civilization–relies on the continuing health of our ecosystems. In recent years, more and more of us have come to realize how the human “conquest” and plundering of nature have disrupted the balance that the world’s climate has enjoyed for thousands of years. We understand now that increasingly severe disruption–which seems inevitable–will result in ever more intense storms, permanent drought, coastal flooding, the probable end of large-scale industry and agriculture, and, perhaps, the collapse of the Gulf Stream conveyor. Very likely, such convulsive changes will lead to widening inequality and social upheaval, wars over shrinking resources, and the potential for terrorist violence a thousand times more devastating than 9/11. Somehow, and soon, the nations of the world will have to resolve to ameliorate the devastating consequences of a rapidly changing climate. In the years ahead, the decisions we make in response to the climate crisis will shape the course of civilization for centuries to come. Polly and the One and Only World presents a cautionary fantasy that will inspire young readers to understand the imperative need to make most effective choices. Mary: I read one review that accused the book of having no helpful or charitable Christians. In your book, is Christianity swept with a broad paintbrush? As in, the federal Christian Protectorate has evolved from current day fundamentalists to a militaristic operation that seeks to cast out infidels, pagans, and followers of “false creeds.” In reality, we know that many Christians are not fundamentalist, are charitable, do believe in climate change, and so on (though that number would appear to be low if we read media reports). I’m just curious about the moral imperative of the story as it appears to caution us about climate change but also appears to make a strong statement against Christianity. Do the two things go hand in hand, and why? Don: As you say, Mary, it’s “not so impossible to believe” that in some grim future, under the profound stresses brought about by a suddenly collapsed capitalist system, a Dominionist-inspired, repressive, Christian theocracy might seize power in the US. Anyway, that’s the fantasy I wanted to explore in the fiction. Extreme (delusional) fundamentalist fervor is amply evident today in the language and convictions of many prominent political and religious leaders. Heartless, reactionary regimes have seized oppressive control in many other cultures throughout human history. A complacent and distracted people’s hold on its own government is far less secure than many realize. Still, I have to protest the suggestion that there are no “charitable Christians” in the novel or that it “stereotypes” Christian people. First, right from the beginning, it’s clear that Polly’s earnest Aunt Leslie, who is as devout a Christian as they come, desires only the best for her pagan niece. After all, for months Leslie has been defiantly sheltering a witch from the authorities–at great risk to herself and her husband. Later on, after Polly has escaped the scavs, she is rescued on the dusty roadside by a good-hearted Christian vegetable seller, Darius. In pity, Darius drives hours out of his way to take Polly to the Fat Crab saloon in Augie. And he warns her not to set foot on a sea ferry. Polly’s stalwart, young companion, Leon, thinks of himself as a Christian. That’s how he was raised. Now, at 16, he is unsure what to believe, particularly in light of the abuses his freethinking father has suffered. Leon’s gentle grandparents in Talla, as well, are generous, protective, loving Christians. And on their journey north, Polly and Leon are offered warm food, a clean bed, and a bath by Candy, another poor, kind-hearted Christian. At one point, contemplating slavery, Polly makes reference to Christian social workers in the far west who oppose the brutal subjugation of any of God’s children, no matter what the Bible apparently condones. Their leaders have been jailed for blasphemy. The Christian man at the small observatory in Pennsylvania, too, insists on showing kindness to Polly, believing her to be a desperate refugee from the purge. He brings her food and tea, and he offers her a place to rest for the night–until he discovers she’s a murdering witch. When Polly finally returns to her farm in Vermont, the good Christian cook and housekeeper, Harriet, is a huge help to Polly. Harriet hides her from Security and then offers to fetch the pilot taper that Polly’s father has left in the icebox. In short, while the governmental authorities (the villains) are as cruelly oppressive as any ruthless gang of ideologues you can name, from Pol Pot’s army to ISIS, the average, mostly Christian people inhabiting the world of the novel are no different in their attitudes, fears, and prejudices from ordinary Americans today. Mary: Thank you for clarifying that, Don. Sometimes reviews can be unfair and not truly reflective of what’s going on in the book, and the author should get to defend that! Going back to Polly; she is a witch in this new world, and a strong, young heroine. I have read a few books that depict females as leaders. The book also seems to parallel the Salem Witch Trials and the treatment of pagans back then. How were you inspired to create this girl’s character? Don: I suppose what first inspired my vision for Polly Lightfoot is my long-standing admiration for heroines in the novels I read as a boy–notably Dorothy Gale (my mother owned all 26 of the original Oz books by L. Frank Baum and Ruth Plumly Thompson) and Lewis Carroll’s Alice, of course. Later, Lyra Belacqua, in Philip Pullman’s Dark Materials trilogy, a series my daughter enjoyed, helped me to bring Polly (and her world) into focus. I wanted Polly to be endowed with magickal abilities so that she could do thrilling, fantastic things (like fly), but also so she could stand in even greater contrast to the others in the story. Mary: When you envision our world, are your thoughts as dark as the dystopian future that you write in the book? Do you think that militaristic government will follow environmental fall-out? Don: No, I hope and believe that in the years to come America will find the cultural and political strength to surmount the ever more serious threats to our fairly stable (for now) social systems. At the same time, I recognize the possibility that the leaders of our greedy oligarchy could be driven by unforeseen events to cause unimagined catastrophe for us Americans and for the entire planet. Mary: Novels about climate change are not new; they go back decades if you look at science fiction imaginaries before our understanding of anthropogenic climate change (many authors were amazingly on track)–and back to the 1970s if you look at authors like Arthur Herzog who worked with scientists who were starting to understand that we were going into a global warming period. Yet, even with this strong sci-fi legacy, more and more novels are coming out that tackle the subject of climate change, much like Herzog did. I assume it is because we understand more about it, and authors like to write about things we need to watch out for. It’s in our nature. Authors treat climate change in their books differently; some are didactic, some are more subtle. Can you describe your approach? Don: I think we’re seeing more climate themes in popular entertainment because they give substance to the real, ominous uncertainty that affects every one of us. And because, month by month, the recognition that we’re in real trouble is more and more widespread. In Polly I’ve depicted the radically altered geography along the (future) East Coast as a set of given features of the terrain that Polly and Leon must navigate. There’s narrative irony in the fact that the two principal characters give little thought to the tragically ruined landscape. Its traits are just dismal aspects of the only world they’ve ever known, so the sense of shock caused by a decades-long-deteriorating climate arises only in the mind of the reader, not in the characters. Mary: Have you gotten any feedback from the young adult audience? Mary: What an astute answer from a child! What’s next, Don? And would you like to add anything else about your book? Don: I’m working on a suspense/mystery novel called The Bigfoot Hunter, the fourth in a series (featuring Town Constable Hector Bellevance) that I’ve brought out with Harmony/Crown over the years. And I hope the readers of Polly will be pleased to know I’m also working on a grand sequel. Mary: Sounds like something to look forward to. Please let me know when the sequel happens. Thanks again for this interview, Don, and I wish you continued success in storytelling. I thank you, also, for your work in telling great stories that make us think about the planet and our place in it.